How has the Miami 21 code primed the city for unprecedented growth? - Archpaper.com How has the Miami 21 code primed the city for unprecedented growth? Eight years in, how has Miami’s form-based code primed the city for unprecedented growth? As more people flooded into Miami’s urban areas, the city took action to help new buildings and infrastructure adapt to the urban shift. In 2008, Miami approved Miami 21, the first New Urbanist zoning code to be applied to a large, preexisting city. The form-based code was applied to a citywide rezoning and was a huge test for an urban planning movement that is more common in small towns like Seaside, Florida, the famous Truman Show locale. The code, enacted as the growing city was quickly running out of land, has led to a reassessment of how Miami works, and has prompted a more logical regeneration of the city’s urban core. New and old Miamians are moving into towers in areas around Downtown, like Edgewater, Brickell, and Midtown. Buildings are being built for people, not cars. Street frontages are activated. Parking garages are hidden. Traffic, however, is getting worse. Mobility suffers with inadequate mass transit, yet people keep coming as international appeal remains as high as ever. As Miami’s density increases, the city needs more effective mass transit. Miami’s growth is reaching a breaking point that infrastructure, backed by new policy, is designed to address. MiamiCentral, a massive new train station and mixed-use mega project, is being built in the center of Downtown Miami where an older train station, demolished half a century ago, once stood. The new station, with residential, commercial, and retail space, started as a terminal for an intra-metropolitan area high-speed rail line that in a few years will take passengers to Orlando in about three hours. 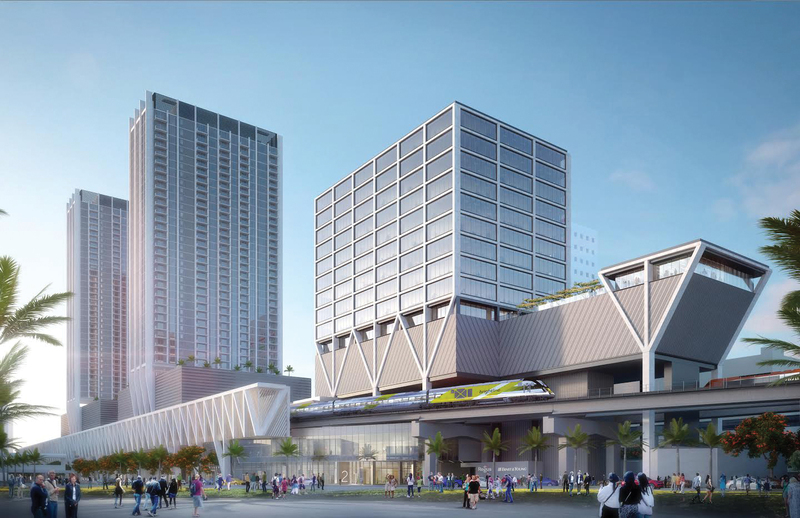 MiamiCentral will also be the terminus for a new spur of Greater Miami’s commuter rail system, Tri-Rail, which will bring commuter rail into downtown for the first time. Other new transit improvements are being considered across the city and the greater metropolitan area, including an expanded trolley bus system, a westward rail connection, a northeast light-rail corridor, and a light-rail line connecting to Miami Beach across Biscayne Bay. Although one of Miami’s newer claims to fame, or at least notoriety, is high-design parking garages, excessive parking requirements meant for a world where everyone has a car are outdated. Parking is a persistent issue with Miami 21, as standard parking minimums are unchanged from the previous auto-oriented zoning code. The requirement to build 1.5 parking spaces per unit means that infill construction on Miami’s standard-sized 50-foot lots is unnecessarily costly and physically impractical, if not downright impossible, once driveways are considered. Last October, the city passed a new rule that allows up to 50 percent parking reductions in transit-accessible areas with a 100 percent reduction for buildings under 10,000 square feet. The changes aim to encourage the small-scale infill urbanism that so often forms the basic building blocks of successful older cities. The main advocate behind the reduction, developer Andrew Frey, is building a small infill development without parking in Little Havana that he hopes will inspire others. As new neighborhoods grow, special zoning districts are being created to suit them. In Wynwood, Miami’s famed mural district, the existing industrial zoning became increasingly unsuitable for a creative neighborhood where people live, work, and go out. A requirement for live-work housing created large and expensive units, not the smaller, more affordable housing that locals desired. Street conditions were basic and not conducive to the pedestrian-driven neighborhood. Last year, the Wynwood Business Improvement District commissioned a master plan that became the Wynwood Neighborhood Revitalization District zoning overlay in July 2015. The code’s standards weren’t adequate for the evolving neighborhood, but a provision allows for these kinds of overlays. Since the implementation of Miami 21, neighborhood groups and developers have created overlays like the Wynwood Neighborhood Revitalization Districts and Special Area Plans (a similar tool developers use when creating a large assemblage) to create neighborhood-appropriate zoning. Miami 21’s revisions at the neighborhood scale demonstrate both its flexibility and imperfections, but it clearly creates a nuanced framework for the city that’s simultaneously logical citywide and hyperlocal to the human scale.